Thick Oval section resin frame won't bend, rust, shatter or require any maintenance. Will withstand 65mph winds and heavy snow loads. 4mm Twin Wall Polycarbonate is virtually unbreakable and provides the best insulation and protection from sun damage to your plants. Very safe for families and pets as it doesn't shatter like glass. Simply push the frame sections together and they snap and lock into place. No tools needs, just wear some gloves to protect your hands. It really is "snap and go", easy ! Rion greenhouses have a proper door handle that when open slots into a retaining latch to keep the door open. 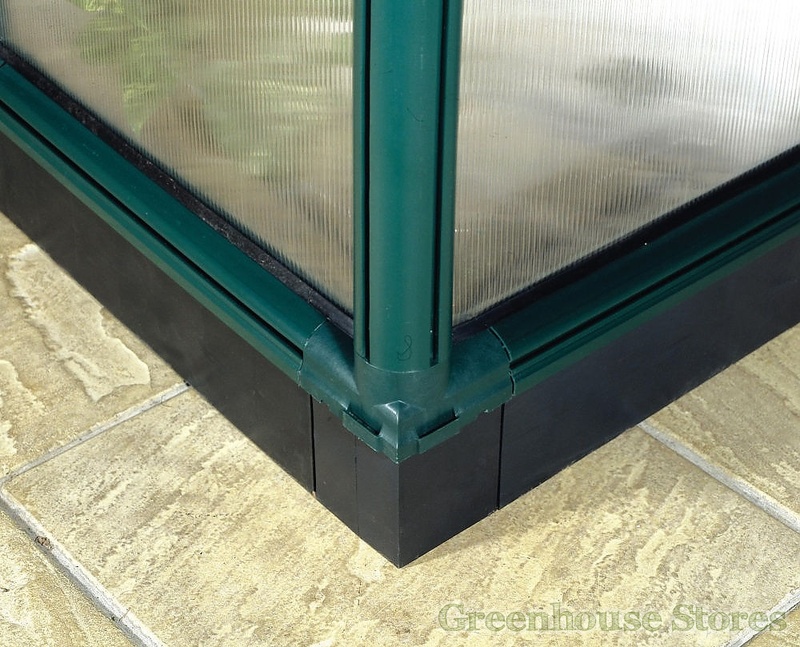 On larger Rion greenhouses with double doors the doors have a heavy duty interior bolt to keep the doors firmly closed. Within 10 days. For deliveries north of Glasgow and Offshore please scroll down for delivery options. Clear Polycarbonate Side Panels - Great Light Transmission. 3 Opening Roof Vents - For Ventilation. The Rion Grand Gardener Greenhouse is tough and ideal for the UK’s often blustery, wet weather. 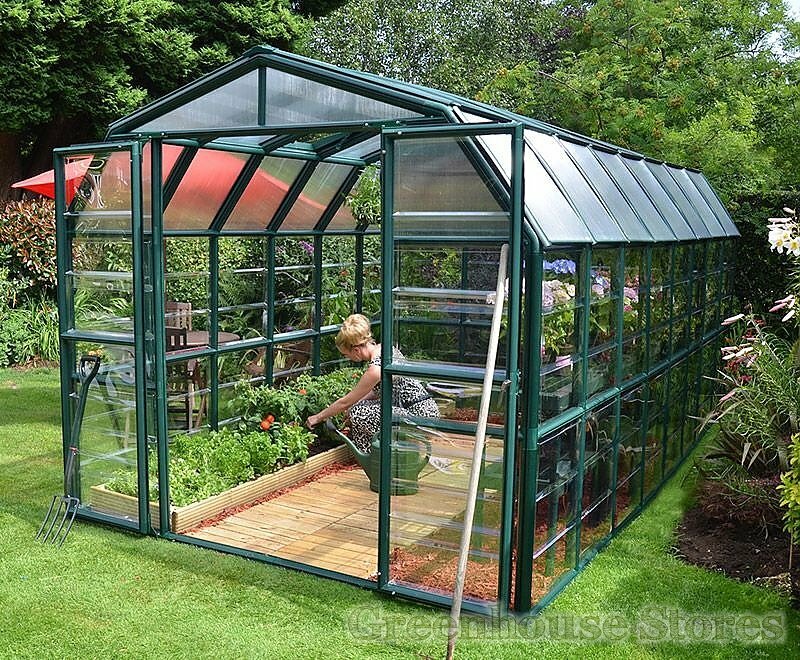 The Grand Gardener is perfect for family gardens or allotment use as it’s polycarbonate glazing won’t shatter. 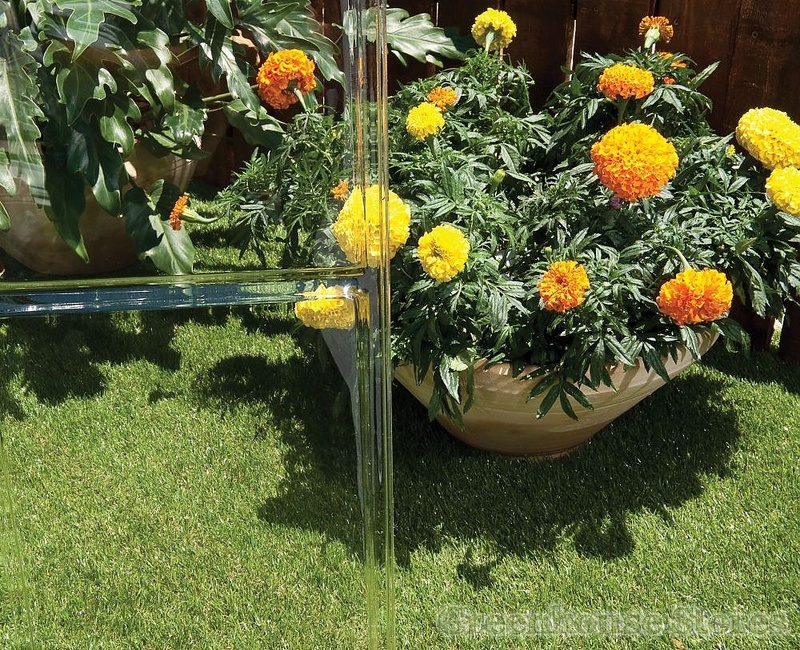 The Grand Gardener 8ft x 16ft Greenhouse is made from poly resin which won’t bend or discolour like aluminium. Complete with it’s crystal clear side glazing to let in light and the 4mm polycarbonate glazing for the roof it offers great growing conditions whilst protecting your plants from scorching from excessive UV rays .This greenhouse weighs in at 540 lb’s making it a good sturdy weight which will help it to survive harsh wind and snowy conditions. The Grand Gardener 8 x 16 has 3 opening roof vents and double outward opening doors with locking latch. Rion greenhouses are very easy to assemble as they use a unique snap-together system making it easy to do-it-yourself. Live in a windy/exposed area? If you live in a very windy environment where the greenhouse is constantly exposed to high winds then we generally recommend a greenhouse with toughened safety glass. 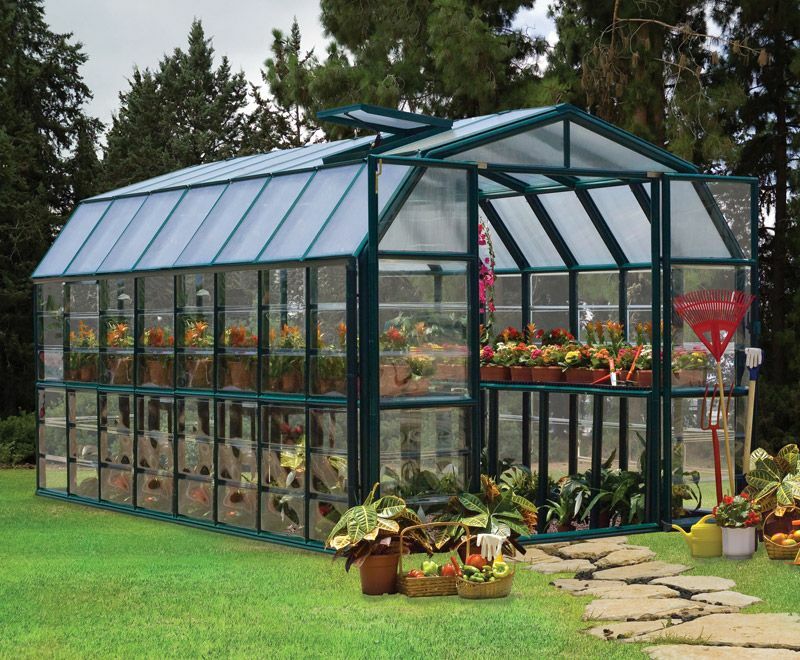 Gives additional height to your greenhouse and improves strength and rigidity in strong winds. 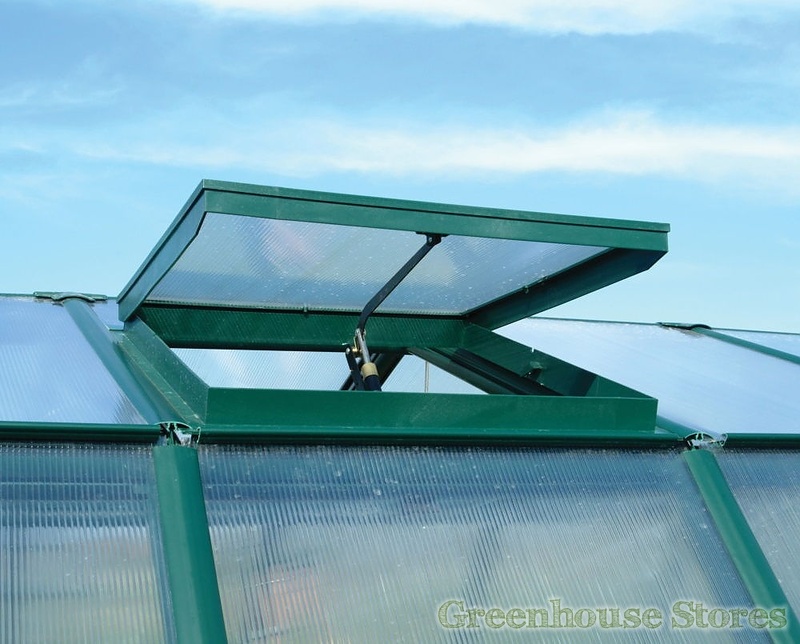 This 10 blade louvre vent will help ventilate your greenhouse by letting in cool air to circulate around the greenhouse. This heavy duty steel work bench with lower shelf is ideal for working in the greenhouse as well as storage. Plant hangers screw into the frame and allow you to run wires or string from floor to roof for growing vine plants. Heavy Duty resin 2 tier staging with drainage holes for plant storage. Additional delivery charge for the following Postal Codes: GY, JE, TR21-25, IM1-9 and all BT post codes.